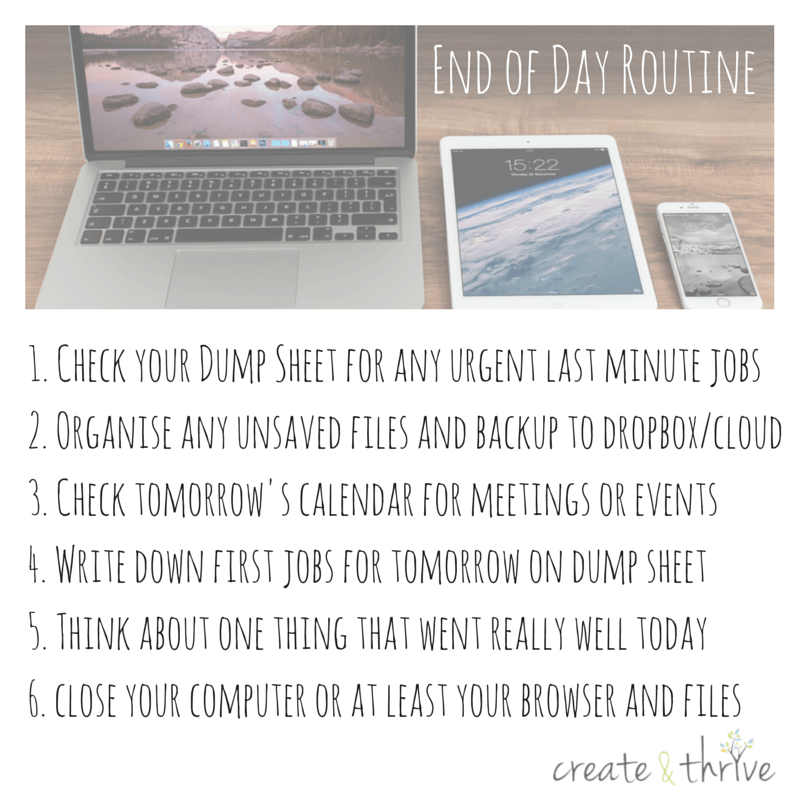 The last post in my series of organisational tools to make my business more productive and help me to stress less is a simple and easy End of Workday routine which I read about over here (This site/resource is no longer available). When I worked in an office or in retail, at the end of each day there were certain jobs that you did to get yourself ready to go home and leave your space in a pleasant state for you to start work the next day. I’ve really missed having a schedule like this in my business and these last few weeks have really allowed me to get a handle on making the most of my time and therefore heightening my productivity. We really take it for granted when we’re working for a big company or for an employer that we can switch off as soon as the work day is done. I know I have missed the freedom to hang out with my friends without thinking about the pile of work on my desk which needs attention! I left a stable 9 – 5 job to pursue a lifestyle which allowed me the freedom to really live my life. So instead of letting my business rule my work hours, I am going to ensure that I can put it aside to have time to be present in my own life. I wouldn’t want to go back to that 9-5 working lifestyle and so now I am happy to run my own life. Thanks to the last few week’s research I can now also be organised enough to have a day off, a weekend away from the computer and workshop, or just space in my brain to relax and forget about it for a few hours. Organising my work is how I’m looking after my mental and physical health. Just like an end of day meditation, an end of workday routine is all about putting to bed the stresses of the day, accepting the achievements you have made and finishing your work in a happy place. Here’s the one I made for myself (which references the Morning Brain Dump) and you most can certainly print it out and put it at your own desk. Or maybe you want to make your own? I will give a little critique at the end of this week but I feel like this one is a no-brainer. It’s something which I know will allow me to ‘finish’ my workday knowing that I’ve got everything done or written down ready to work on tomorrow. I also think it’s a nice place to finish my four weeks of organisational tool testing! I’ve really enjoyed the process of finding the processes which assist me to get my jobs done. I actually didn’t think that they would all be so helpful. In fact, I thought I would just choose one of these scheduling tools! Interestingly, the mix of the Morning Brain Dump, Daily Schedule, Marketing Calendar and End of Workday Routine are just a few of the tools which I use for time management. I also use Trello, Google Calendar and a wall calendar to keep me on track. It all works together to keep me working efficiently and stressing less. Let me know if you have an end of workday routine or if you try the one above. I would also love to hear if anyone has tried all four of the techniques in my organisation series of posts or if you use your own combination of tools to keep you on track.